Sunday, Redskins coach Mike Shanahan benched his quarterback late in a winnable game, claiming "cardiovascular issues" made him unsuited to a hurry-up offense. 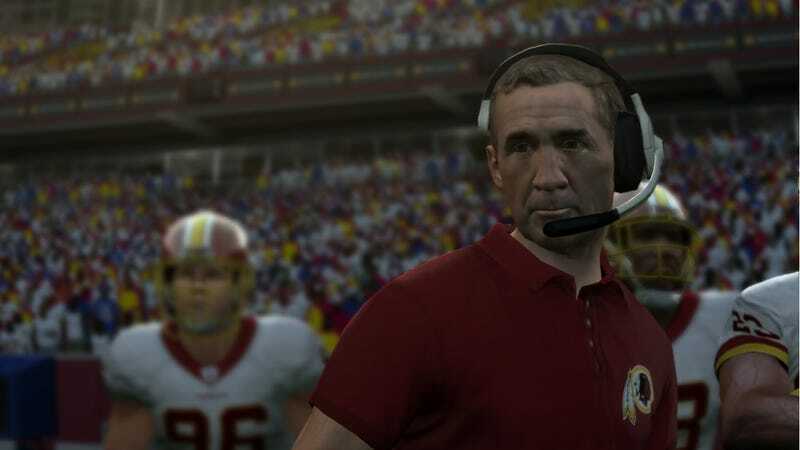 Most thought Shanahan was full of crap, but Madden NFL 11 took him at his word. Hilariously. Lo and behold, in the latest roster update, Donovan McNabb's stamina rating has dropped to an 87 from a 95. Over Twitter, I asked Donny Moore, the Madden "Ratings Czar," if they really bought Shanahan's excuse, which was ripped by everyone from Mike Ditka to John Riggins. The wink-smiley says not really. "Maybe @terrellowens or @FreddieMitchell can help us out here? ;)" was the reply, referring to former McNabb teammates who have had uncomplimentary things to say about his crunch-time fitness. Unlike overall ratings changes, which are much more common (and impactful, and McNabb did drop to 89 from 90), single-attribute goosing or dinging seems to be more of a sly commentary on the preceding week's events. For example, this week Dallas defensive lineman Igor Olshansky got a 12 point boost in "Swagger" thanks to his ludicrous fourth quarter celebrations while the Cowboys trailed the Giants by 18 a week ago. And earlier in the year, Randy Moss reached the rare upland territory of a 100 rating (in "spectacular catch," a largely cosmetic attribute) thanks to a circus grab against the Jets that made all the highlight reels. Olshansky's swagger has no material effect on your game's outcome; the difference between 99 and 100 in any attribute is in prestige only. And in 5-minute quarters, it's hard to imagine McNabb's stamina ever coming into play (87 is still above average, anyway). This looks more like the gang at EA Sports Tiburon just having some fun with the week-by-week narrative of America's most popular sport.